Here’s some easy sentence correction problems I wrote. The answers are in a spoiler block at the end of the post. Feel free to email to post comments or email with questions. 1. The city of Memphis is located in the U.S. state of Tennessee, where the Mississippi and Wolf Rivers meet just south of it. (A) The city of Memphis is located in the U.S. state of Tennessee, where the Mississippi and Wolf Rivers meet just south of it. (B) The city of Memphis is located in the U.S. state of Tennessee, in a location that is just south of where the Mississippi meets the Wolf River. (C) The city of Memphis is located in the U.S. state of Tennessee, just south of where the Mississippi and Wolf Rivers meet each other. (D) The city of Memphis is located in the U.S. state of Tennessee, just south of where the Mississippi meets the Wolf River. (E) The city of Memphis is located in the U.S. state of Tennessee, just south of the meeting of the Mississippi and Wolf Rivers. 2. From 1994-1999 Nelson Mandela was the president of South Africa, a time in which the African National Congress were the ruling political party of the country. (A) From 1994-1999 Nelson Mandela was the president of South Africa, a time in which the African National Congress were the ruling political party of the country. (B) From 1994-1999 Nelson Mandela was the president of South Africa, when the African National Congress were the political rulers. (C) From 1994-1999 Nelson Mandela presided over South Africa, while the African National Congress ruled it. (D) Nelson Mandela was the president of South Africa from 1994-1999, during which the African National Congress was the ruling political party. (E) Nelson Mandela was the president of South Africa from 1994-1999, however the African National Congress were the ruling political party. 3. As it is with the island of Ibiza, the city of Cabo is a destination for college students on vacation. (A) As it is with the island of Ibiza, the city of Cabo is a destination for college students on vacation. (B) Just as the island of Ibiza, the city of Cabo is a destination for college students on vacation. (C) The same as the island of Ibiza, the city of Cabo is a destination for college students on vacation. (D) In a similar way to the island of Ibiza, the city of Cabo is a destination for college students on vacation. (E) Like the island of Ibiza, the city of Cabo is a destination for college students on vacation. 4. The verbal section of the GMAT is intended to test a student’s knowledge of English grammar, diction, and how well they know rhetorical construction. (A) The verbal section of the GMAT is intended to test a student’s knowledge of English grammar, diction, and how well they know rhetorical construction. (B) The verbal section of the GMAT is intended to test a student’s knowledge of English grammar, diction, and rhetorical construction. (C) The verbal section of the GMAT is intended to test a how well a student knows English grammar, whether they know proper diction, and rhetorical construction. (D) The verbal section of the GMAT has the intention of testing whether or not a student knows English grammar, diction, and rhetorical construction. (E) The verbal section of the GMAT has the intention of seeing if a student knows English grammar, diction, and rhetorical construction. 5. Students that are native English speakers often score well on the Verbal section of the GMAT with little preparation, while non-native speakers have to study for much more time on it. (A) Students that are native English speakers often score well on the Verbal section of the GMAT with little preparation, while non-native speakers have to study for much more time on it. (B) Students that are native English speakers often score well on the Verbal section of the GMAT with little preparation, however, non-native speakers oftentimes have to study it more. (C) Students that are native English speakers often score well on the Verbal section of the GMAT with little preparation, although non-native speakers have to study it for much more time. (D) Students that are native English speakers often score well on the Verbal section of the GMAT with little preparation, while non-native speakers have to study much more. (E) Students that are native English speakers often score well on the Verbal section of the GMAT with little preparation, but non-native speakers have to study it for much more time in order to score well. 6. The student gave four practice exams for the GMAT and achieved an average score of 650. (A) The student gave four practice exams for the GMAT and achieved an average score of 650. (B) The student took four practice exams for the GMAT and achieved an average score of 650. 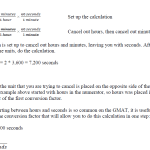 (C) The student finished four practice exams to their end for the GMAT and achieved an average score of 650. 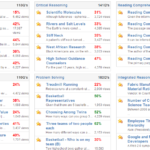 (D) Four practice exams were taken by the student for the GMAT and achieved an average score of 650. 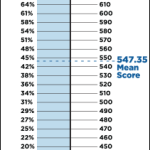 (E) Four practice exams were completed by the student for the GMAT and achieved an average score of 650. 7. Bob’s victory in the triathlon can be attributed to his superior strength and also his above-average conditioning. (A) Bob’s victory in the triathlon can be attributed to his superior strength and also his above-average conditioning. (B) Bob’s victory in the triathlon can be attributed both to his superior strength plus his above-average conditioning. (C) Bob’s victory in the triathlon can be attributed both to his superior strength and to his above-average conditioning. (D) Bob’s victory in the triathlon can be attributed to his strength, which was superior, and his above-average conditioning. (E) Bob’s victory in the triathlon can be attributed to his superior strength and the fact that his conditioning was above-average. 8. Seafood exports doubled their level during the second quarter, due to an increase in foreign demand. (A) Seafood exports doubled their level during the second quarter, due to an increase in foreign demand. (B) Seafood exports were twice the level during the second quarter, due to an increase in foreign demand. (C) Seafood exports doubled during the second quarter, due to an increase in foreign demand. (D) Due to an increase in foreign demand, seafood exports were twice the level in the second quarter. (E) Due to an increase in foreign demand, seafood exports in the second quarter were twice what they were previously. 9. The main idea of the professor’s essays are a defense of the concept of free-market economics. (A) The main idea of the professor’s essays are a defense of the concept of free-market economics. (B) The main idea of the professor’s essays is defending free-market economic concepts. (C) The professor’s essays have defending the concept of free-market economics as their main idea. (D) The professor’s essays have a main idea of the defense of the concept of free-market economics. (E) The main idea of the professor’s essays is a defense of the concept of free-market economics. 10. In order to become better at soccer, a player must improve his cardiovascular conditioning, increase his skill at ball handling, and adapt to playing as part of a team. (A) In order to become better at soccer, a player must improve his cardiovascular conditioning, increase his skill at ball handling, and adapt to playing as part of a team. (B) In order to become better at soccer, a player must improve his cardiovascular conditioning, increase his skill at ball handling, and he must adapt to playing as part of a team. (C) In order to become better at soccer, a player’s improvement is needed in the area of cardiovascular conditioning, ball handling, and he must adapt to playing as part of a team. (D) In order to become better at soccer, a player must improve his cardiovascular conditioning, he should increase his skill at ball handling, and adapt to playing as part of a team. (E) In order to become better at soccer, cardiovascular conditioning, skill at ball handling, and team playing are needed for a player.